Summer is here and so are the best discounts of the year from Norton! From now to the end of the month you can save $20.00 instantly on Norton Security 2015 with Backup at the official Norton Store (no coupon code needed). Then once the 2016 versions are released sometime in late September, you’ll be able to upgrade for free to the new version with your current subscription membership. This deal cuts the price down from $89.99 to just $69.99 for one year of protection on up to 10 devices. You also have the two-year option which is on sale for $139.98 (that’s $30.00 off the list price). They also carry volume licenses for small business if you are looking to buy protection for five or more PC’s/Mac’s. Norton.com only sells the download-version so no CD or box will be shipped to you (you’ll need to download it from their site directly after purchase). Amazon is is the #1 volume reseller of antivirus and internet security software. It’s no wonder why as they they often have the lowest prices from anyone out there. 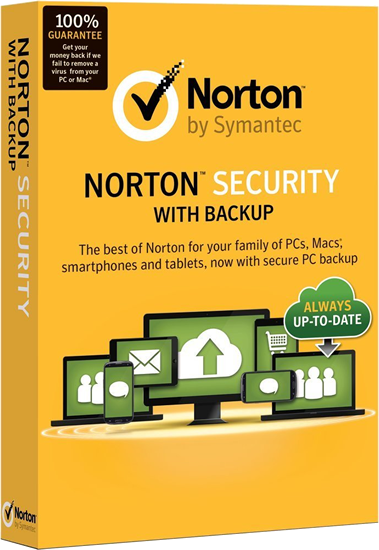 They have the latest Norton Security 2015 with online backup versions priced for as much as 33% off the list price with either free shipping if you spend over $35.00 or free instant download (for those that are environmentally-friendly and don’t want to add to packaging waste). Prices may vary so see site for offer details. When renewing your annual license. If your current Norton license is expiring soon, you can take advantage of special upgrade and renewal pricing for existing Norton customers. For their Security products, they have an automatic $10.00 savings if you qualify as an upgrader . You will also be able to upgrade to the 2016 version once it’s available by clicking the “Renew” link in your currently installed version and entering your activation key in the “I have a key or code to enter” box. If you still have a few weeks remaining on your existing license then we recommend that you wait until it expires completely before purchasing the renewal (you’ll reset the subscription term if you do so early and possibly loose as any remaining days under the old license). Offer only available to existing Norton users. Nothing is better than making your own deal, right? Well, with Staple’s price match guarantee, you can have them go down from whatever sale price they have listed in-store or online to the lowest one you can find from one of their competitors. This includes some of the big box retailers like Walmart, Best Buy, Costco and Office Depot. But your best bet will be to price match against Amazon (when it says “ships and sold from” them). 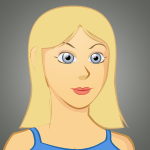 Special student pricing is also available from both Norton.com and academic software resellers like Journey Ed. It’s discounted at 50% off the list price but unfortunately there are no other promo codes that can be used with the student versions. This makes this deal not as good as some of the other ones that are now live, especially as you will also need to go through the hassle of getting verified. Unlike other software companies that offer students “stripped down” versions of the software, Norton gives you the same features and protection as the standard one. Learn more about the available student discounts on software. If you’re still not sure if Norton Antivirus is the best security software solution for you even after seeing that it received multiple awards, including the Editor’s Choice Award by PCMag, then test it out for free before you buy. Norton has all of the current 2015 versions available to download and test for free for up to 30 days. And let’s say you decide to order a box from Norton anyway without testing and then see that it’s not fully compatible with your PC setup, then you’ll have 60 days to return it for a full refund. See our refund terms page for full details. How and where do I use a Norton coupon? 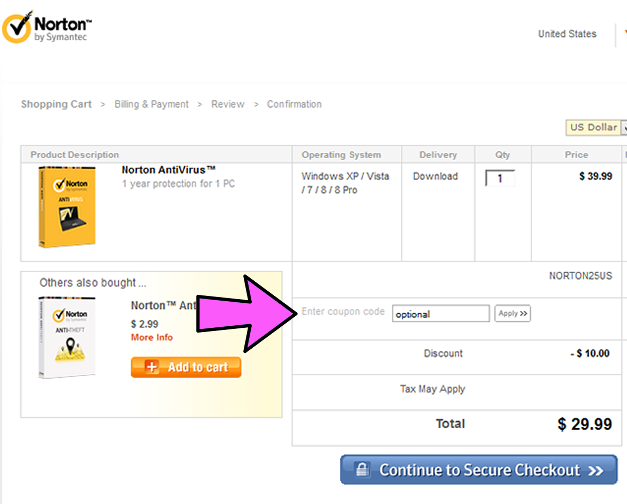 As you’ve noticed, some of Norton Antivirus deals are automatically discounted (i.e. they are on a limited time sale) and others will require a code. Usually the codes are issued by the manufacturer and only work for orders placed on through their official store. If you’ve never used an online coupon before or are having difficulties in redeeming the discount, then be sure to follow these steps outlined below. Step 1: Choose the offer that you would like to use. Only one discount can be applied per order so choose the one that gives you the best deal on the version that you would like to purchase. 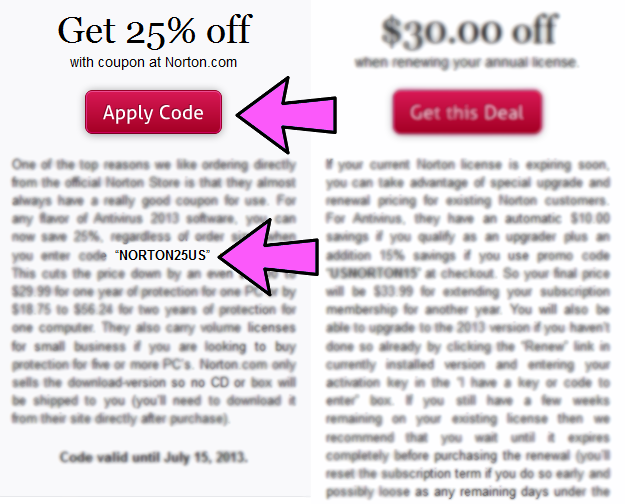 In this example, we will be using promo code “NORTON25US” that will apply a 25% savings when ordering from Norton.com. 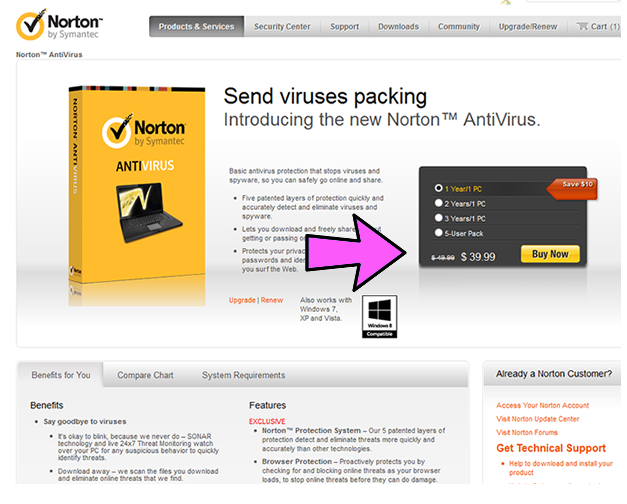 Step 2: Copy the code as it appears and click on the “apply code” link which will take you to the Norton Store. Step 3: Once on the Norton website, choose the number of licenses and years of protection that you would like to buy. If you buy the two or three year option saves you a bit more than just the annual year plan as a multiple-year discount is already included in the sale price. After you have made your selection, click on the “buy now” button. Step 4: You will now be taken to the order confirmation. This is where you will enter the code that you copied in Step 1 into the “Enter Coupon Code” box. Once entered, click on the “apply” button. You should now see the 25% off discount reflected in the sale price (listed for $29.99 vs. $39.99 for the one-user annual license). Step 5: If everything is successful, you can now continue through to the secure checkout. If not, you can double check the coupon code to see if it was entered correctly (even the slightest change to the code or modification can render it useless). It’s also possible that the discount that you selected only applies to a specific version or product. How long do I have to wait for Norton 2016 to be released? We're we're watching all of the 2016 Norton news and have estimated an early September release for the new versions. As soon as it becomes available, be sure to come back to us here at Software Voucher for the best deals on Norton and Symantec software!